Neighborhood Emergency Team (NET) volunteers are Portland residents trained by the Portland Bureau of Emergency Management (PBEM) and Portland Fire & Rescue to provide emergency disaster assistance within their own neighborhoods. NET members are trained to save lives and property. Anyone who lives or works in Portland can become a NET, and anyone over the age of 14 is welcome to attend meetings, regardless of whether they’ve completed NET training. Training includes light search and rescue, basic disaster medicine and triage, radio communications, fire suppression, disaster psychology, and trauma intervention. 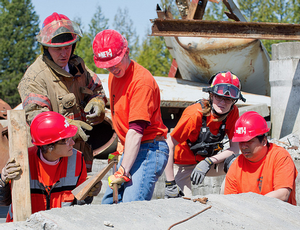 After completing basic training, NET members also receive access to free advanced training and practice opportunities, including drills at Portland Fire & Rescue’s Scenario Village facility. WHAT HAPPENS AT NET MEETINGS? At meetings, we discuss issues specific to the neighborhood (local hazards, resources, etc), work on creating an Operations Plan for dealing with emergencies, organize ongoing team trainings, practice our skills, plan outreach and recruitment efforts, and encourage each other to keep building our personal preparedness kits. Is your team missing from this list? We're still working on getting pages set up for all active teams. View PBEM's list of active NET teams so that you can at least find contact information for your neighborhood.